Do you guys understand daylight savings? I for one don’t get it. Having said that, I don’t mind the extra hour that we get when clock goes back. The worst part of this whole daylight savings is that I have to start my day early and finish the cooking, videos and photo shoots by 2 pm. As it is the weather is mostly grey this time of the year and with the change in time, it gets dark at 3-4 pm. I have tried liking/using artificial light for pictures but I just prefer the natural light so much more and there’s always a scarcity of that in winters! Because I am trying to finish work quickly, I am mostly relying on my Instant Pot for quick meals. And since it’s this cold (we had snow this weekend!! ), there’s nothing better and comforting than a bowl of chili. 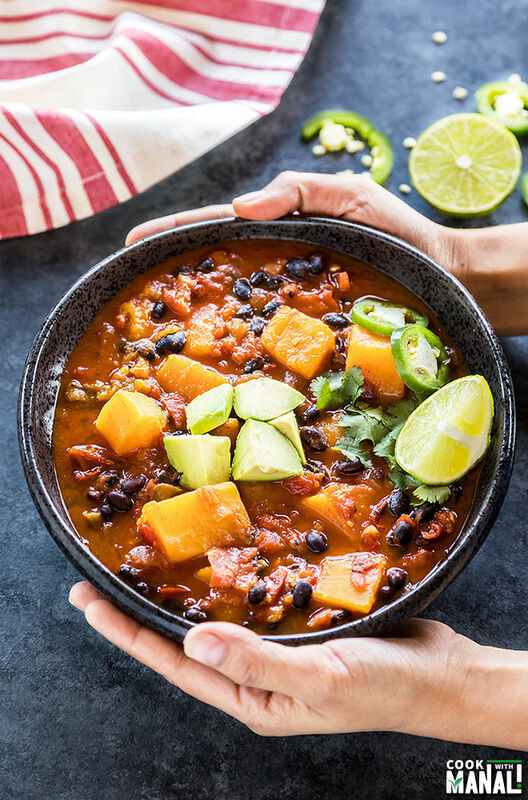 This Instant Pot Butternut Squash Chili is perfectly spiced, really flavorful and super easy to put together using your Instant Pot. 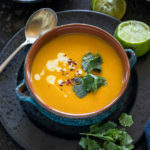 I love butternut squash during this time of the year, I think it’s my favorite fall produce. It’s such a tasty vegetable and you can use it in so many different ways to create nutritious meals. I remember making a pasta sauce with it sometime back but I never got around sharing it. That’s the thing, sometimes I don’t really have the time to measure things and click pictures and so those recipes never make it to the blog. Anyway, I am sure I will make that pasta again and will be sure to click pictures this time around and share it with you guys! 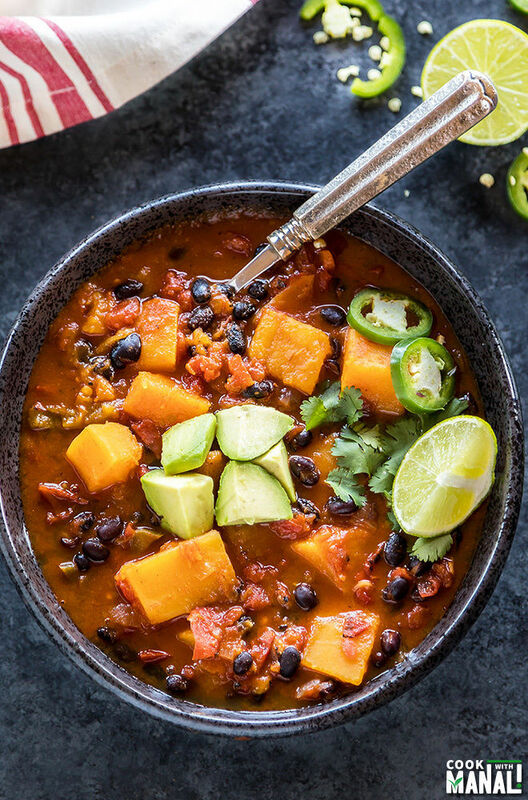 For now, let’s talk about this Butternut Squash Chili! ✓ this chili is vegan, gluten-free, nut free and dairy-free! 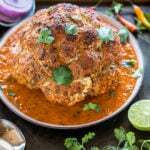 ✓ is spiced with chipotle, cumin & smoked paprika! This chili turned out a bit spicy and that’s because I used jalapeños and also the diced tomatoes that I used were fire roasted with green chilies. You can adjust this to taste, skip the jalapeños and use normal diced tomatoes (minus the chilies) for a less spicy chili. 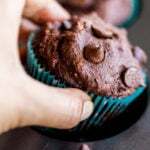 If you don’t mind the heat – stick to the recipe! 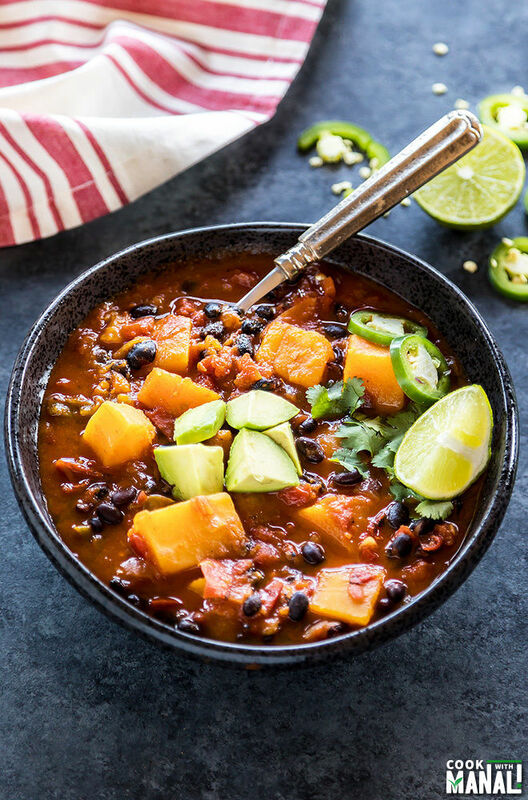 I like flavorful chili and this instant pot butternut squash chili is just that! 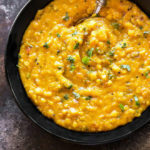 Super flavorful, spicy, hearty and so comforting for the cold weather. This would also be great to serve at your Thanksgiving table. 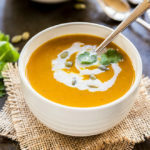 Looking for more recipes with butternut squash? Check these out! Press saute button on the Instant Pot and add oil to it. Once the oil is hot, add bay leaf and onions. Cook the onions till they are soft, around 3 minutes. Add diced jalapeños, chopped garlic and saute for 30 seconds. Add the spices- chipotle powder, cumin powder, smoked paprika and mix. Cook the spices for 30 seconds. Stir in black beans, diced tomatoes and salt. Cook the beans and tomatoes with the spices for 2-3 minutes. Add vegetable broth or water and mix. Add butternut squash on top, do not stir. Close the lid and set valve to sealing. Press the manual/pressure cook button and cook on high pressure for 5 minutes. The pressure valve should be in the sealing position. Let the pressure release naturally for 5 minutes and then do a quick pressure release by manually moving the pressure valve from sealing to venting position. 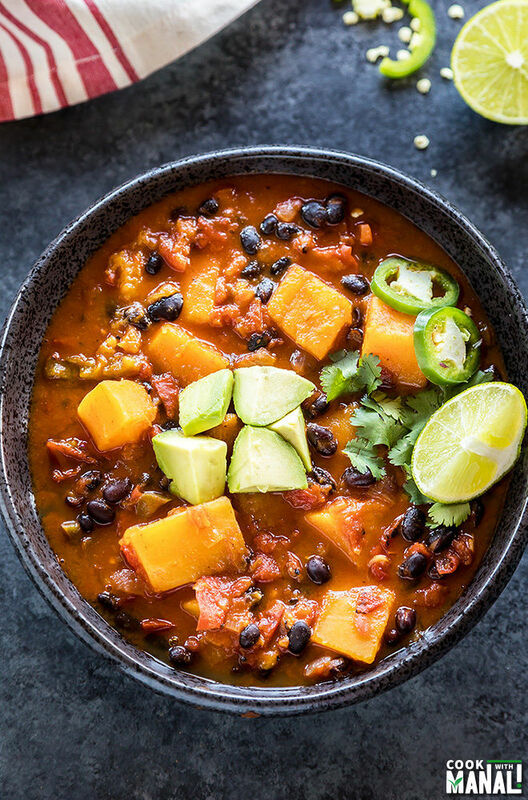 I like to serve this vegan butternut squash chili with diced avocados and cilantro. You may use any topping of choice, tortilla chips would be nice too! * Adjust spice levels to taste. Skip the jalapenos if you don’t like heat in your chili. * I used a can of diced tomatoes which had green chilies in it so my chili was bit spicy. Use a regular can of diced tomatoes to cut down the heat. 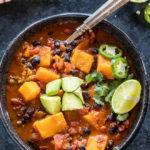 Vegan Butternut Squash Chili made in the Instant Pot. Hearty meal for cold days! Stir in black beans, diced tomatoes and salt. Cook the beans and tomatoes with the spices for 2-3 minutes and then add vegetable broth (or water) and mix. 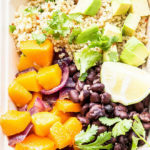 Stir in lime juice and serve butternut squash chili with diced avocado, cilantro and lime wedge! Yummy! I love spicy food and this sounds delicious! Thank you..spicy food is the best! be? Looking forward to making this! Hi Lyn! You can make this on the stove top by cooking until butternut squash is nicely tender..maybe around 45 minutes? and slow cooker..I would do low for 5-6 hours. hope this helps! Daylight savings is indeed a strange thing! But I kinda like it. Of course, I don’t like it getting dark at 4-5pm, but that’s better than waiting until 9am for the sun to come up. (That’s what our local weatherman said would happen if we got rid of daylight savings…9am!) When we moved up north, I had to learn to embrace artificial light because of these very dark winter days. I’m ok with it. But man, I need you to teach me some of your natural light skills! 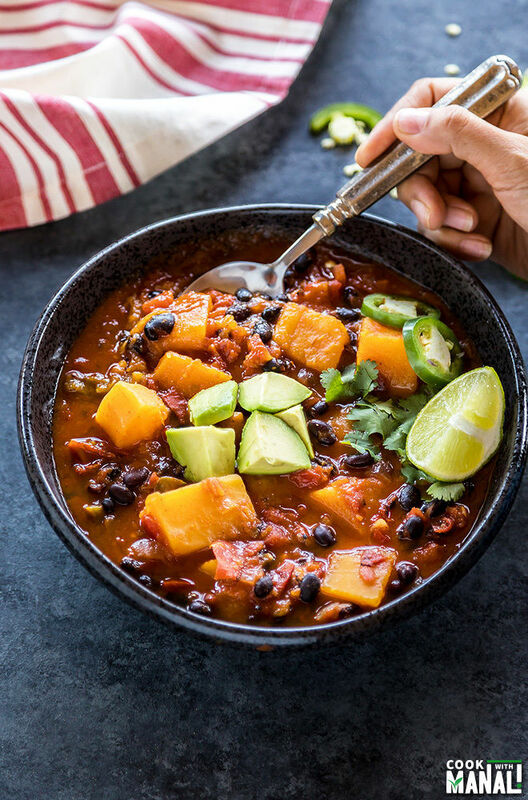 🙂 Also, I’ve been on a huge butternut squash kick lately, and this chili sounds (and looks) amazing!! I made this today. Didn’t have squash so used sweet potatoes. Delicious! Good to know, sweet potatoes are awesome! As a new instant pot owner I was so happy to see your very precise directions. I will be making this soon, sounds so delicious! I love this– I’ve made it 3 times in a month! Tried with different beans and different tomatoes (canned vs fresh) and love it every time! Thanks for sharing. About how many cups for the squash? 2 heaping cups..remember the squash pieces should be more than an inch at least..don’t chop it fine else it will all turn mush! Can you use frozen butternut? Yum! What size instant pot is this for? I doubled the recipe and just made it but it looks very watery. Will it thicken? Hi Saba, generally one should not double the liquid when doubling recipe on IP. Since it’s not stove top and pressure cooker, water doesn’t really evaporate like it would on stove top. So two times really thin it down. Whenever you double a stew/chili/curry recipe in IP..just do 1.5 times water..you can always add more later if you like. Right now, I would press saute and let the water evaporate..it will also thicken as it cools down. hope this helps! Are the canned beans drained? 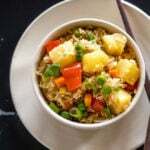 Could I make this with soaked dried beans? I don’t like using canned. I guess I could cook the beans first, but throwing it all in together would be nice. Our family loved this. Omitted jalapeños since we aren’t fond of spicy dishes. 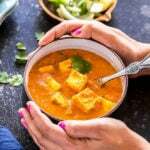 Easy to make (I already had cube squash). Great recipe; we will ale this again—thanks.